As Andy aka already wrote, any length of cable produces a delay. However by limiting the length you know what the maximum delay is and you can correct for that. Ethernet does this by specifying a minimum frame size in combination with a maximum cable length. 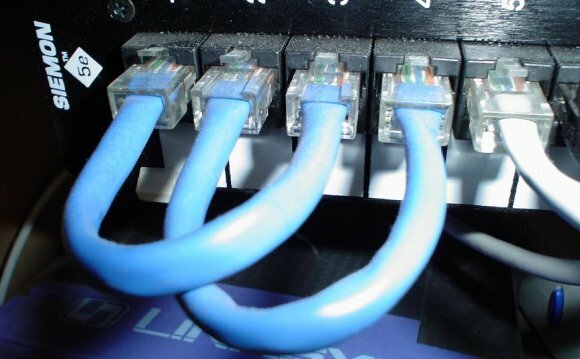 Thus ensure that even two computers on the ends of the cable (and thus the furthest away from each other as allowed) will see that the other is transmitting before they finish their own frame. Both computer #1 and #3 want to transmit something. Both check the cable and see noone else transmitting. Both start to transmit their own small frame which will travel down the cable at limited speed. Neither computer 1 or computer 3 will see the others signal while they are transmitting. Both will receive a readable frame from the other. however computer 2 will see an unidentifiable mess rather than one or more valid frames. The solution employed by Ethernet is to limit cable length to about 200 meters and make a framesize of at least 64 char mandatory. (If the frame is shorter it will be padded). That way any transmitting from one edge of the network will reach the other side of the network. Any computer (well, any NIC) wanting to transmit needs to check if the line is clear and stays clear from the start of transmission until it has send at least the min. frame size. From ancient times the min. frame size and max. cable length have been defined for Ethernet. This is a standard. Even with UTP we still adhere to those standards. This makes the values always the same and not worth discussing.